Jaipur 7 December: ‘The British Polo Day India’ took place at the Rajasthan Polo Club in Jaipur. The second edition of this event witnessed Trick Ridding Display by 61st Cavalry, Marwari Horse Dance, Brompton Bicycle Polo, once a popular sport in Rajasthan also started afresh on this occasion. The audience was enthralled with the British Army Team V/s Jaipur Polo Team match. Mr. Tarang Arora of Amarpali was the Guest of Honour and HH Rajmata Padmini Devi of Jaipur was the Chief Guest on the Occasion. The event started off with a traditional Bagpiper Band performance by Army Band of 5/5 Gorkha Regiment followed by the British and Indian National Anthem. The Jaipur Polo Team won the match 5-4. The goals for the wining team were scored by Ashok Chandana s1 goal in the 3rd Chakkar, Lt. Col. Ravi Rathore 1 goal in the 4th Chakkar, HH Maharaja Sawai Padmanabh Singh 3 goals — one each in the 1st, 2st and 3st Chakkars. The fourth member of the team was Chirag Parekh. The Most Valuable Player was awarded to Lt. Paddy Selfe KRH of the British Army Team who scored 2 goals — one in the 1st Chakkar and second in the 3th Chakkar. Gaston Devrient scored 2 goals in the 1st Chakkar and in the 4th Chakkar, respectively. The other players of the British Army Team were : Capt George Walker KRH, Capt Robert Freeman-Kerr KRH. 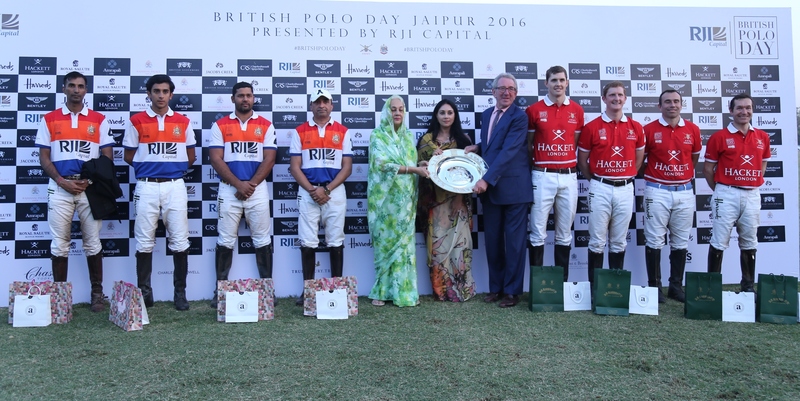 The winner Team was awarded the Shield by Rajmata Padmini Devi, Princess Diya Kumari and Justice Sir David Steel. The Umpires for the event were Bhawani Kalvi and Nandu Singh. The Referee was Maharaj Narendra Singh.